Six Generations, new Genealogical Card Game for Children, by Alaskan Inventor Fyodor Soloview Can Spark Population Growth in U.S.A., Canada, Europe and Russia. Alaskan inventor Fyodor Soloview discovered a simple way to increase fertility rates of future parents, now 5-12 year-old children, by pointing their interest to genealogy and saving their dynasty from extinction. The governments of European nations have been worried about progressive declines in populations, which will face them with serious shortage of labor. Nobody had an answer before as to how to secure an average fertility rate of over 2.1 babies per woman, which required human reproduction. To fix this dilemma, Soloview said, governments, schools and parents should educate children in family genealogy. At home, children must observe the family tree with several generations of their ancestors. To help the parents, Fyodor Soloview, a father of four children, designed the family history card game Six Generations, which looks like a deck of playing cards. "You just let you children play Six Generations, and they will figure it out by themselves, what their own role in securing their family dynasty is," the inventor said. "There will be questions, of course, about the names of their great-grandparents. Even if you can't answer, your children will discover with a big surprise that their kin goes back thousands of years, and that each child is the last 'survivor' of that dynasty. If they never produce their own children, their whole family 'kingdom' will be destroyed. Saving their family from extinction will become their life-time mission from now on." Kids, who have an ability to identify themselves with the heroes of the games, are going to put themselves in the place of Jacob and Emily -- siblings who are representing the youngest generation in the Six Generations card game. To "jump" one generation up, the child needs to grow up, get married and have several babies. This non-violent game teaches why everyone has 62 ancestors in just the last five generations. Colorful drawings of 72 people in the deck are supplemented with different first names, which, according to the vital statistics, are the most popular from the time and 21 countries they are from. "In the modern world of democracy, the members of a family tree circle should be printed on the playing cards, instead of Kings, Queens and Jacks, which have been representing the political ideology of monarchic Europe for seven centuries," Soloview said. "Playing cards can teach children about genealogy and family values." Soloview, a former bilingual tutor at elementary schools in Anchorage, was surprised that students are forced to deal with playing cards depicting monarchs. "George Washington finished with the monarchy in America in 1776, and I completed his mission in 2004, designing democratic playing cards without royal suits," Soloview declared. The Six Generations card game is sold at http://www.Amazon.com and at the publisher's web-site, http://www.sixgenerations.com. Thanks to everybody for the forthcoming reviews and discussions. Six Generations, the card game that teaches children to procreate, in order to preserve their family heritage by Yehuda's Jergames Blogspot. One of his points with the cards is to remove the aspect of royalty from the suits, so that all the cards, including the often ignored 2's through 10's, get treated with the respect they deserve. Hmmm. I’ll bet you didn’t know you had a family dynasty. But the game does look fascinating - and inexpensive. 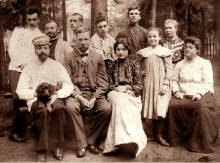 German-Russian-Ukrainian family with ancestors of Fyodor Soloview in 1911 in Russia.